For most of us our desktop is like a virtual home… and overtime it can get cluttered, disorganized, or we might just want to add a little style to it. Windows users have done desktop customization for just about as long as I can remember; customizing it to fit your needs and style can make your machine more efficient to use as well as something you’re excited to work on. One of my favorites for instance, is Fences from Stardock. In the not so distant past I purchased a Macbook Pro to have a shiny new penny to play with and a new world to learn about. I won’t get into the details, but eventually I decided I really didn’t like OSX. There are however some REALLY slick things that OSX does that Microsoft really needs to build equivalents to in the Windows world. I’ve written in the past about different ways to get Expose and Spaces on a Windows machine. BetterDesktopTool aims to bring all of that functionality under one simple to use desktop customization application. Exposé on OSX (all of this has been replaced with Mission Control on the mac) would expose overlapping windows on your desktop and show them in an organized thumbnail view. It would make it so you can quickly locate and switch to any window or get to any file on the desktop. Better Desktop Tool handles this through Windows-Overview which arranges all windows in a non-overlapping layout. In short, it takes every window on your desktop, regardless if it’s minimized or shown on screen, and displays then in an orderly way on screen so you can see them from a birds eye view.Windows has something similar in it’s Aero Flip 3D feature activated by hitting Windows-Tab. BetterDesktopTool handles this more like Exposé and by that I mean it’s more useful. You simply hit a key combo, the mouse wheel, or move you cursor to a screen hotspot you define and you’ll get an beautifully organized overview of your running application. You can specify that it be applied to minimized, non-minimized and foreground application windows and it support multi-monitor setups. BetterDesktopTool also provides Desktop-Overview that moves all windows away from your desktop to give you access to shortcuts and gadgets on your desktop. This works similar to the “Show Desktop” shortcut, except that it returns all your Windows to where they were before. It’s simple and effective. Why Windows has never embraced the virtual desktop metaphor is something I’ll never understand. OSX, via Spaces, and Linux have had it for so long and it’s something I find very powerful. Windows users have had alternatives like Sysinternals Desktops, mdesktop, Dexpot. I’ve written about Dexpot in the past. The Professional Edition handles the virtual desktop effortlessly bringing you Spaces functionality to Windows. Want a virtual desktop? How about 64 of them? BetterDesktopTool allows up to 64 virtual desktop environments (previously mentioned Dexpot gives you up to 20). I’d argue that using that many would put a cramp in your productivity but it is cool that it’ll support that many if you really wanted it. 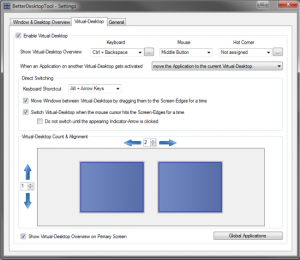 Just like Window-Overview and Desktop-Overview you can configure the Virtual Desktop functionality with keyboard and mouse shortcuts as well as with hotspots on screen. 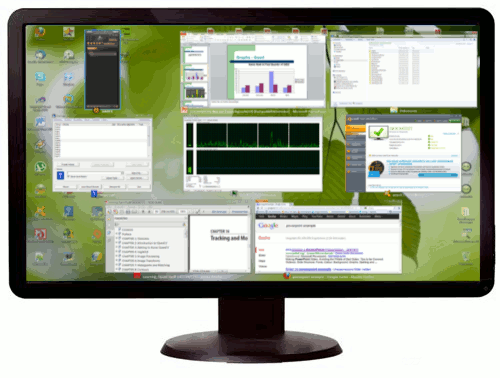 The Overview function of the Virtual Desktop portion shows all Virtual-Desktops including all windows at a time. You can define global windows that are available on all Virtual Desktops and you can move between each virtual desktop with ease. You can even move any window from one desktop to another while the grid view is active. 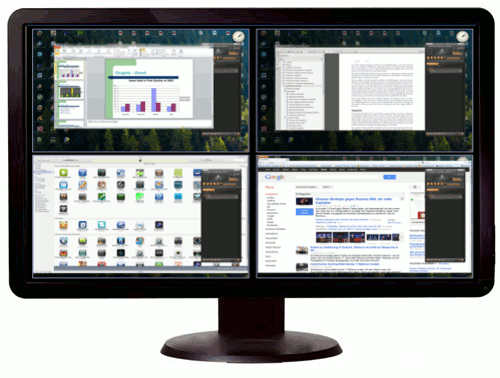 Multi-monitor support is available for the Virtual Desktops as well. Setup and configuration in BetterDesktopTool is a snap. The configuration screens are simple to navigation and provide keyboard, mouse, and hotcorner settings. You can define direct switching settings and specify how many virtual desktops you want. Earlier I’d mentioned Global Windows. When you’re in Window-Overview mode you can simply right-click a Windows to turn it into a global window that stays in place across all virtual desktops. This is handy for something like your music player that you might want to always have the controls close at hand. Seeing is believing and this video lets you get a good overview of the application in action (and it has a snazzy background track!). The download contains the Standard Edition and the Professional Edition. You can try the Professional Edition free for 30 days. The Standard Version normally costs $9.99 and the Professional Version is $19.99. For a limited time it will be sold to my readers at a discounted rate! You can buy it for $8.00 for Standard and $15 for Professional.This offer is valid for the next 2 weeks so grab your copy of BetterDesktopTool quick!